I was lucky to have grown up with people creating things all around me. For my siblings and me, to be ‘building’ something was a childhood constant, often to the chagrin of our parents. We were encouraged to be creative when we needed something and learned to solve problems in the process as there were very often problems. Thank goodness we were not limited by preconceived notions of only one right way. I have sewn for as long as I can remember, learning at my mother’s knee. I got back into sewing seriously while working at a local outstanding fabric store. I thought of it as kind of post-graduate work in textiles which included color, texture, weave, fiber content, drape, quality of fabrics and appropriate fabric for the project in mind. I taught children’s sewing classes as well as other more specialized subjects. I began to sew for customers I met while working at the store and soon thereafter joined what was then the Custom Clothing Guild and started my own small business. The Guild, which eventually became the national Association of Sewing and Design Professionals, stressed education among many things. 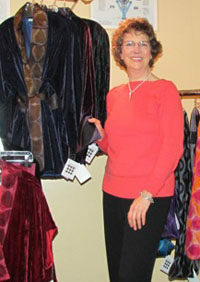 I have, and continue to, study with a wide variety of sewing educators and designers. Learning never ends – there is always a new idea or technique to take away and add to a dressmaker’s bag of skills.